Context: In head-and-neck cancers (HNCs), the incidence of recurrence after radiation therapy or the second primary tumors is 30%–50% and 20%, respectively. With an operable recurrence, surgical resection is considered the standard of care. For patients presenting with unresectable recurrence or medically unfit for surgery, definitive reirradiation with chemotherapy is the only potentially curative treatment. Aims: The aim of this study was to evaluate locoregional control (LRC), overall survival (OS), and toxicity in patients receiving reirradiation for recurrent HNCs. Subjects and Methods: Records of 35 patients reirradiated with three-dimensional conformal radiotherapy and intensity-modulated radiotherapy (IMRT) for HNC between January 2013 and June 2015 were reviewed and analyzed. Patients were followed on a quarterly basis for 2 years. The Radiation Therapy Oncology Group morbidity criteria were employed to assess the acute and late toxicity. LRC and OS were calculated from the final day of radiation treatment using the Kaplan–Meier method. Results: The median follow-up was 14 months. The median time interval between initial radiation and reirradiation was 51 months (range 12–240 months). The median reirradiation dose was 60 Gray (Gy) (range 24–70 Gy). Eight (23%) patients underwent prior salvage surgical resection. The 1-year OS and LRC rates were 48% and 60%, respectively. Severe Grade 3-4 reirradiation-related toxicity occurred in 12 patients (34.28%). Conclusions: The present study achieved local control and OS comparable to patients with available literature. The treatment-related morbidity was higher as all patients did not receive IMRT in reirradiation setting. The aim of this study was to retrospectively evaluate locoregional control (LRC), overall survival (OS), and toxicity in patients receiving reirradiation in our institute for recurrent HNCs. From January 2013 to June 2015, in a retrospective manner, we studied 35 patients with histological proof of recurrent disease or second primary tumor after the previous irradiation and no evidence of distant metastases. The approval of the Institutional Ethical Committee was obtained. All patients were required to undergo a complete ENT evaluation, computed tomography (CT) scan, and/or magnetic resonance imaging (MRI). The assessment of distant metastasis included a chest CT scan, abdominal ultrasound, and a bone scan according to symptoms. Laboratory tests were performed to evaluate hematologic, renal, and hepatic function. The patient and tumor characteristics are shown in [Table 1]. The treatment was given with dual linear accelerator using three-dimensional (3D) conformal radiotherapy or intensity-modulated radiation therapy (IMRT). IMRT was applied through step-and-shoot technique in conjunction with multi-leaf collimator. The spinal cord was considered as the most important organ at risk during reirradiation. Majority of patients received their first irradiation with standard parallel opposing fields on cobalt machine. Due to the use of large portals during the initial radiation, the reirradiation dose to the OARs was kept as low as possible. The gross tumor volume (GTV) definition for reirradiation included the tumor itself and the positive lymph nodes. A margin of 1.5 cm was applied to GTV to include the clinical target volume (CTV). In all patients, intermediate risk areas with a reasonable risk for microscopic disease, such as the ipsilateral or contralateral neck levels, were defined as different CTVs. In patients who underwent surgery, the CTV included the surgical resection bed with 1.5 cm of safety margins. A margin of 3–5 mm was applied on all CTVs to define the planning target volume (PTV) and on account of setup and treatment delivery uncertainty. The prescribed dose to the intermediate risk areas was 54–60 Gray (Gy), whereas the involved areas were planned for 64–70 Gy. Most of the patients received concurrent chemotherapy (weekly cisplatin) with reirradiation. All patients signed informed consent regarding the chemotherapy/radiation-induced morbidity due to reirradiation. Patients were followed on a quarterly basis for 2 years. Acute toxicity was assessed on a weekly basis during the treatment. Late toxicity was assessed on the every subsequent follow-up visit persisting for 3 months posttreatment. The maximum score for either acute or late morbidity was chosen as the final toxicity score. The radiation therapy oncology group morbidity criteria were employed to assess the acute and late toxicity. The follow-up evaluations included history, clinical examination, and complete ENT evaluation. Biopsies were done where necessary. CT scans imaging was performed on the first few follow-up visits and thereafter if deemed necessary based on signs and symptoms. LRC and OS, calculated from the final day of radiation treatment. LRC was defined as the absence of locoregional failure within the reirradiated volume or regional lymphatics (including those outside the treatment volumes). Patients who developed distant metastases after the retreatment were censored with respect to local control at the time the metastasis was documented. The endpoints of this study were LRC and OS, calculated from the final day of radiation treatment using the Kaplan–Meier method. In all calculations, the statistical significance level was taken as 0.05. All statistical analyses were performed using SPSS software for Windows, version 20.0 (IBM Corp., Armonk, New York, USA) [Figure 1]. The median follow-up was 14 months (range = 5–33 months). Eight (23%) patients underwent salvage surgical resection. About 27 (77%) patients received concurrent chemotherapy along with the reirradiation. The median time interval between initial radiation and reirradiation was 51 months (range 12–240 months). The median reirradiation dose was 60 Gy (range 24–70 Gy). 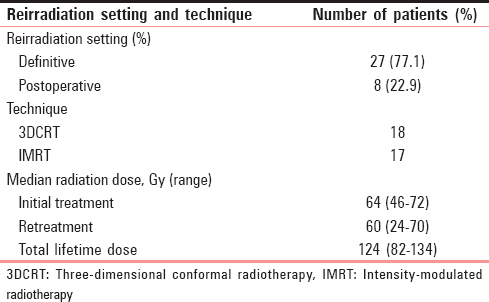 The median dose at the first radiation was 64 Gy (range 46–72 Gy) [Table 2]. Median spinal cord and brainstem maximum doses actually delivered were 28 Gy (range, 2–46 Gy) and 22 Gy (range, 0–56 Gy), respectively. The 1-year OS and LRC rates were 48% and 60%, respectively. Acute mucositis (Grade III) was observed in ten patients, six patients as Grade II, and in twenty-nine patients as Grade I. Grade III toxicity to the skin was seen in six patients, whereas Grade II skin toxicity was observed in 25 patients, and fourteen patients had Grade I skin toxicity. Grade III laryngeal toxicity was observed in four patients. Late radiation toxicities (>3) were observed in twelve patients. Marked atrophy of the mucous membrane developed in nine patients, complete mouth dryness was reported in five, severe subcutaneous fibrosis was reported in fifteen, severe laryngeal edema in four patients and severe dysphagia in three patients. Three patients required a tracheostomy. One patient expired during the treatment. However, that was due to cardiac arrest unrelated to our treatment. Osteoradionecrosis (ORN) and radiation myelopathy were not observed. Patients presenting with recurrent or second primary tumors should undergo careful restaging evaluation before the treatment with curative intent, that is, surgery or reirradiation. CT or MRI to evaluate the extent of a recurrent tumor, positron emission tomography/CT, or at a minimum, chest CT, should be strongly considered to evaluate for metastatic disease. The American College of Radiology (ACR) expert panel HNC reviewed the relevant literature and established the appropriate criteria for RERT (Reirradiation). Patient selection is a key step in determining which patient should be offered RERT. Evaluation should include careful restaging imaging, a detailed history, the assessment of life expectancy, assess to the prior radiotherapy details including dose received by critical structures such as the spinal cord, brain stem, optic apparatus, mandible, brain, and carotid arteries. Comorbidities, performance status, speech, swallowing, and hearing assessment, squeal of previous treatment, that is, fibrosis, carotid stenosis, ORN, cartilage necrosis, and arytenoids edema or other severe toxicity. Mucosal tumor extent should be properly assessed using the physical examination including palpation and fiber-optic endoscopy. For patients with tumor involving or in proximity to carotid artery, Doppler ultrasound should be performed, and appropriate vascular intervention including stent placement should be considered. The ACR recommends that patients with a reasonable performance status who do not have a severe soft tissue or bone toxicities from prior therapy and do not have the distant metastatic disease are likely to be benefited by RERT. Regarding radiotherapy dose and regimen, the ACR expert panel recommends RERT concurrent with chemotherapy. A limited RT target volume encompassing known disease with a safety margin was favored over elective nodal RERT. RERT with <50 Gy was considered inappropriate, and 60 Gy or higher was recommended. Continuous course once (2 Gy per fraction) or twice daily RT (1.2 Gy per fraction) was considered appropriate. Twice daily RT using 1.5 Gy fractions with the planned split course was considered appropriate but split course once daily RT was not recommended. The appropriate dose constraints for RERT are controversial. Central nervous system and soft tissue are the dose-limiting organs at risk for RERT. Literature approves the cumulative spinal cord dose of 50 Gy. Soft tissue can tolerate up to 90% of the original dose. Tolerance dose of the carotid artery is uncertain, but it should be contoured as avoidance structure. Dose to mandible should be kept assuming 50% recovery. With modern technology dose, escalation is possible with less toxicity. IMRT create highly conformal dose distribution around the target with a steep dose gradient outside the target allowing sparing of organs at risk, thus, improving the therapeutic ratio. It is very critical in the setting of RERT, as most of the critical structures have received doses almost reaching their tolerance limit. Lee et al. studied 74 patients who underwent reirradiation with the IMRT technique. Two years of locoregional control and OS were 19% and 12%, respectively, in patients with unresectable disease. In patients with resectable tumors, the LC and OS were 45% and 36%, respectively. The toxicity was acceptable, with 4% of chronic neurologic problems. Sulman et al. treated 74 patients with the IMRT technique. At 2 years, the LR control and OS were 58% and 54%, respectively, in patients with unresectable tumors. Acute and late toxicity (32%) was observed, but there was no fatal side effect. In patients in a postoperative setting, the LC rate and OS were 76% and 68%, respectively. The acute and late side effects were at a level below 25%. Single institution study by Riaz et al., of HNC patient treated with RERT (IMRT in 78%) clearly showed that long-term survival is feasible in this setting, but there is a significant risk of toxicity. The overall rate of any Grade 3 or higher toxicity was 31.3%. In three grades, five toxicities occurred, two due to the carotid blowout and one due to ORN of clivus. Nearly, 7% of patients require surgery for ORN of the mandible, 4% of patients had Grade 3 or higher hearing loss, and two patients developed esophageal fistulas requiring the reconstructive surgery. One patient developed unilateral blindness. Performance status of the patient, interval from the previous RT, comorbidity, and volume of overlap with the previous RT field were the prognostic factors for survival in different RERT studies., This study achieved LRC and OS of 60% and 48%, respectively, at 1-year. ORN and radiation myelopathy were not observed. A comparison of 3D-conformal radiation therapy (3DCRT) and IMRT in 38 patients underwent CRERT with weekly carboplatin (area under the curve 2) and paclitaxel (50 mg/m2) showed significantly greater late toxicity with 3DCRT compared to IMRT (44% vs. 7%). Several institutional reports of IMRT for RERT have revealed favorable disease control and toxicity profile when compared to historical standards. Toxicities observed are the combined effects of prior multimodality treatment, salvage surgery, and concurrent systemic therapies. The present study had 18 patients receiving 3DCRT (as these patients could not afford IMRT) reradiation and 17 receiving IMRT reradiation. The observed treatment-related toxicity in this study was higher than the pure IMRT reradiation studies. The present study achieved local control and OS comparable to patients with available literature. The treatment-related morbidity was higher because all patients did not receive IMRT in reirradiation setting. The limitations of this study included the retrospective nature, small size, and relatively short follow-up. These issues may be addressed by the large, prospective trials using the latest conformal techniques to increase the therapeutic ratio. Overgaard J, Hansen HS, Specht L, Overgaard M, Grau C, Andersen E, et al. Five compared with six fractions per week of conventional radiotherapy of squamous-cell carcinoma of head and neck: DAHANCA 6 and 7 randomised controlled trial. Lancet 2003;362:933-40. Coatesworth AP, Tsikoudas A, MacLennan K. The cause of death in patients with head and neck squamous cell carcinoma. J Laryngol Otol 2002;116:269-71. Parsons JT, Mendenhall WM, Stringer SP, Cassisi NJ, Million RR. Salvage surgery following radiation failure in squamous cell carcinoma of the supraglottic larynx. Int J Radiat Oncol Biol Phys 1995;32:605-9. Bachar GY, Goh C, Goldstein DP, O'Sullivan B, Irish JC. 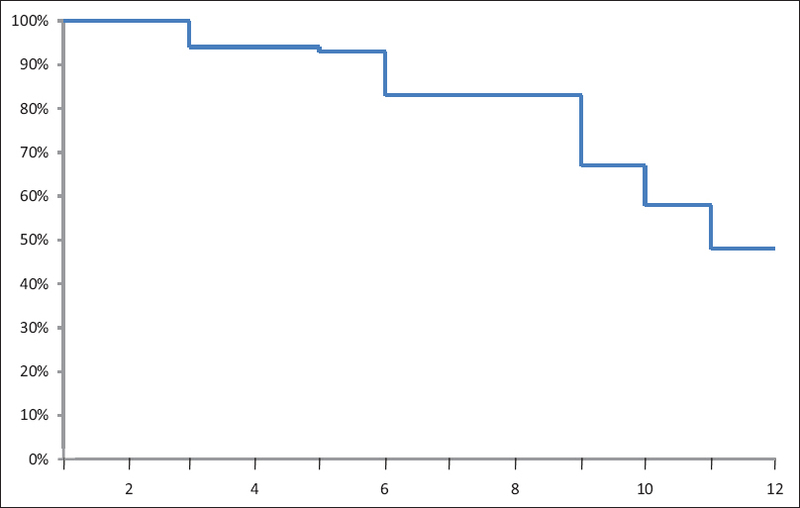 Long-term outcome analysis after surgical salvage for recurrent tonsil carcinoma following radical radiotherapy. Eur Arch Otorhinolaryngol 2010;267:295-301. Zafereo ME, Hanasono MM, Rosenthal DI, Sturgis EM, Lewin JS, Roberts DB, et al. 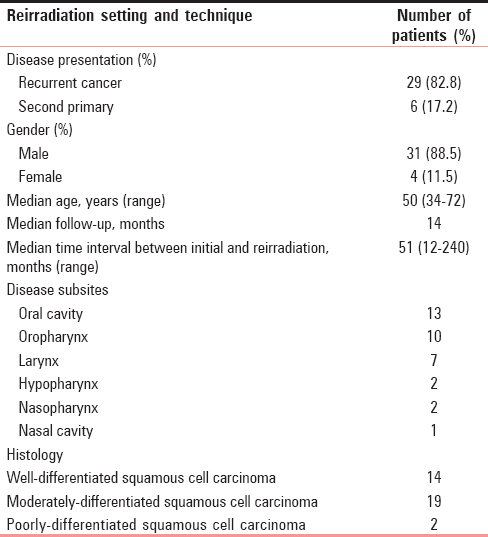 The role of salvage surgery in patients with recurrent squamous cell carcinoma of the oropharynx. Cancer 2009;115:5723-33. Janot F, de Raucourt D, Benhamou E, Ferron C, Dolivet G, Bensadoun RJ, et al. Randomized trial of postoperative reirradiation combined with chemotherapy after salvage surgery compared with salvage surgery alone in head and neck carcinoma. J Clin Oncol 2008;26:5518-23. Kasperts N, Slotman BJ, Leemans CR, de Bree R, Doornaert P, Langendijk JA, et al. Results of postoperative reirradiation for recurrent or second primary head and neck carcinoma. Cancer 2006;106:1536-47. De Crevoisier R, Domenge C, Wibault P, Koscielny S, Lusinchi A, Janot F, et al. Full dose reirradiation combined with chemotherapy after salvage surgery in head and neck carcinoma. Cancer 2001;91:2071-6. McDonald MW, Lawson J, Garg MK, Quon H, Ridge JA, Saba N, et al. ACR appropriateness criteria retreatment of recurrent head and neck cancer after prior definitive radiation expert panel on radiation oncology-head and neck cancer. Int J Radiat Oncol Biol Phys 2011;80:1292-8. Mabanta SR, Mendenhall WM, Stringer SP, Cassisi NJ. Salvage treatment for neck recurrence after irradiation alone for head and neck squamous cell carcinoma with clinically positive neck nodes. Head Neck 1999;21:591-4. Forastiere AA, Leong T, Rowinsky E, Murphy BA, Vlock DR, DeConti RC, et al. Phase III comparison of high-dose paclitaxel + cisplatin + granulocyte colony-stimulating factor versus low-dose paclitaxel + cisplatin in advanced head and neck cancer: Eastern Cooperative Oncology Group Study E1393. J Clin Oncol 2001;19:1088-95. Seiwert TY, Jagadeeswaran R, Faoro L, Janamanchi V, Nallasura V, El Dinali M, et al. The MET receptor tyrosine kinase is a potential novel therapeutic target for head and neck squamous cell carcinoma. Cancer Res 2009;69:3021-31. Gourin CG, Watts T, Williams HT, Patel VS, Bilodeau PA, Coleman TA, et al. Identification of distant metastases with PET-CT in patients with suspected recurrent head and neck cancer. Laryngoscope 2009;119:703-6. Chen AM, Farwell DG, Luu Q, Cheng S, Donald PJ, Purdy JA, et al. Prospective trial of high-dose reirradiation using daily image guidance with intensity-modulated radiotherapy for recurrent and second primary head-and-neck cancer. Int J Radiat Oncol Biol Phys 2011;80:669-76. Lee N, Chan K, Bekelman JE, Zhung J, Mechalakos J, Narayana A, et al. Salvage re-irradiation for recurrent head and neck cancer. Int J Radiat Oncol Biol Phys 2007;68:731-40. Sulman EP, Schwartz DL, Le TT, Ang KK, Morrison WH, Rosenthal DI, et al. IMRT reirradiation of head and neck cancer-disease control and morbidity outcomes. Int J Radiat Oncol Biol Phys 2009;73:399-409. Popovtzer A, Gluck I, Chepeha DB, Teknos TN, Moyer JS, Prince ME, et al. The pattern of failure after reirradiation of recurrent squamous cell head and neck cancer: Implications for defining the targets. Int J Radiat Oncol Biol Phys 2009;74:1342-7. Riaz N, Hong JC, Sherman EJ, Morris L, Fury M, Ganly I, et al. Anomogram to predict loco-regional control after re-irradiation for head and neck cancer. Radiother Oncol 2014;111:382-7. Kharofa J, Choong N, Wang D, Firat S, Schultz C, Sadasiwan C, et al. Continuous-course reirradiation with concurrent carboplatin and paclitaxel for locally recurrent, nonmetastatic squamous cell carcinoma of the head-and-neck. Int J Radiat Oncol Biol Phys 2012;83:690-5.